Since Rawls defined justice as a virtue of the basic structure, we have witnessed profound social and political changes as a result of an increasingly globalized world. These transformations have revealed the limits and inadequacies of the characterization of that structure in A Theory of Justice. Globalization heightens the visibility of problems for which Rawlsian theory does not offer an adequate response, such as those transcending national boundaries, as it is in the case of ever-increasing number of international migrants. This chapter analyzes proposed alternatives to four aspects of the Rawlsian basic structure alongside the normative perspectives introduced into theory along with these proposals. The idea of the basic structure of justice is thus expanded by including not only public institutions but rather the complex structural relations across the globalized world. The chapter argues that migrants should be entitled to direct claims against individuals and institutions that are responsible for those conditions that structure and drive their migration. 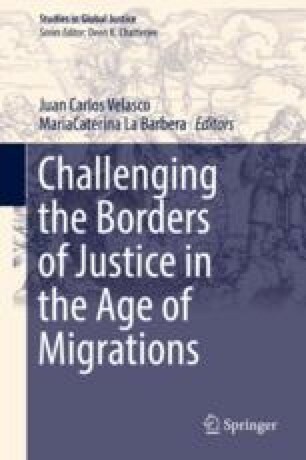 This chapter argues not only that there is no such thing as the injustice faced by migrants but rather a complex network in which several forms of injustice intersect that can be addressed using various dimensions and frames that are only analytically severable. This work has been supported by the R&D grant “Human rights and global justice in the context of international migrations” (FFI2013-42521-P) funded by the Spanish Program for the Promotion of Scientific and Technical Research for Excellence. ———. 2016. In the Shadow of Working Men. Qualitative Sociology, 1–21. https://doi.org/10.1007/s11133-016-9332-9. La Barbera, MariaCaterina. 2015. Identity and Migration: An Introduction. In Identity and Migration in Europe, ed. M.C. La Barbera, 1–13. Dordrecht: Springer. https://doi.org/10.1007/978-3-319-10127-9_1. ———. 2015. Massive Loss of Habitats Triggers New Array of Migrations. Trumanfactor. http://trumanfactor.com/2015/saskia-sassen-interview-2-15136.html. Accessed 6 Jan 2017.